SCENE 46. The exposition from Scene 45 continues as Potzdorf delivers Barry to Balibari in a coach. It goes from the general (“this is what we want you to do”) to the specific (“this is how we want you to do it”). I can’t think of a reason why this must be a separate scene, except that it’s a slightly different dramatic beat and that Kubrick recognized that too much exposition in a given scene makes it feel too long. SCENE 47. Barry meets Balibari, posing as a Hungarian to meet a man posing as a Frenchman (or perhaps an Italian – Balibari seems to have intentionally fudged his fake identity to make him harder to pin down). Barry’s goal in the scene is to fool Balibari, and, remarkably, he succeeds in passing himself off as a Hungarian speaking German. That’s how good Barry has gotten at deception: he’s fooled Potzdorf in to thinking he’s loyal to him, and now he’s fooled an actual con man into thinking he’s Hungarian. But, what do you know, love, again, enters the story, as Barry instantly falls in love with the Chevalier. What attracts Barry to Balibari? The narrator makes mention of his regal bearing, but Barry already knows that’s a facade. No, what Barry loves about Balibari is that Baliberi is who Barry wants to be. 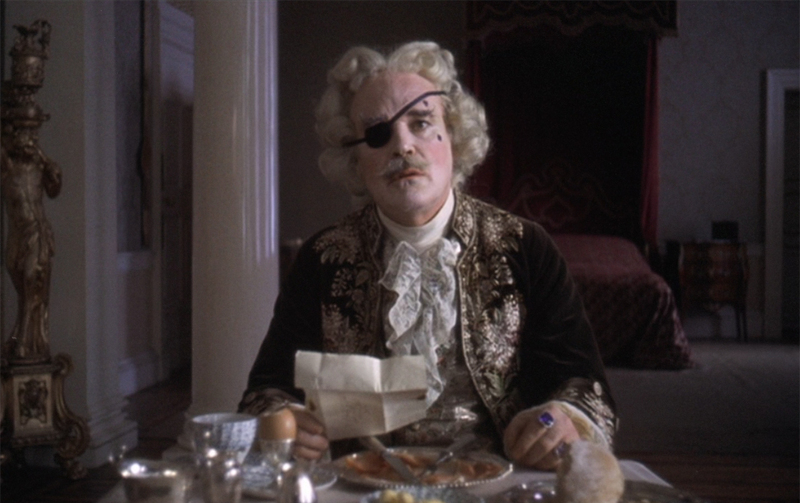 Balibari has succeeded in doing what Barry has wanted all his life: he’s got fabulous wealth, style for miles, taste and charm, and is a complete and utter fraud. He tearfully confesses his deception to Balibari, who, as a fellow Irishman who perhaps sees his younger self in Barry, takes him on as an assistant and agrees to maintain Potzdorf’s ruse. SCENE 48. 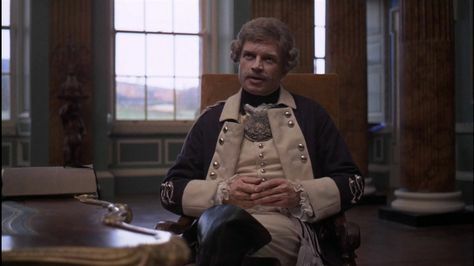 There is then a “debriefing” scene, as Barry reports back to Potzdorf about the specifics of Balibari’s life but not the general — that is, he reveals everything down to the smallest detail of Balibari’s daily life, but does not reveal things like “Yes, he is an Irish con man.” The dramatic point of the scene is an escalation of Barry’s ability to lie convincingly to Potzdorf as he transitions from one father-figure to another. SCENE 49. 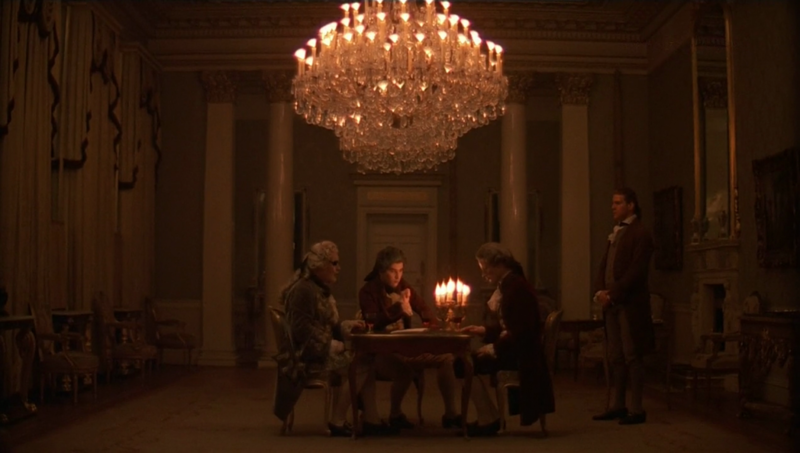 Cards come and go in importance in Barry Lyndon. It was a card game that brought on the Nora calamity, and now they reassert themselves in the narrative as Barry, now no longer a victim to chance, uses cards — that is, cheats at cards — to get what he wants. 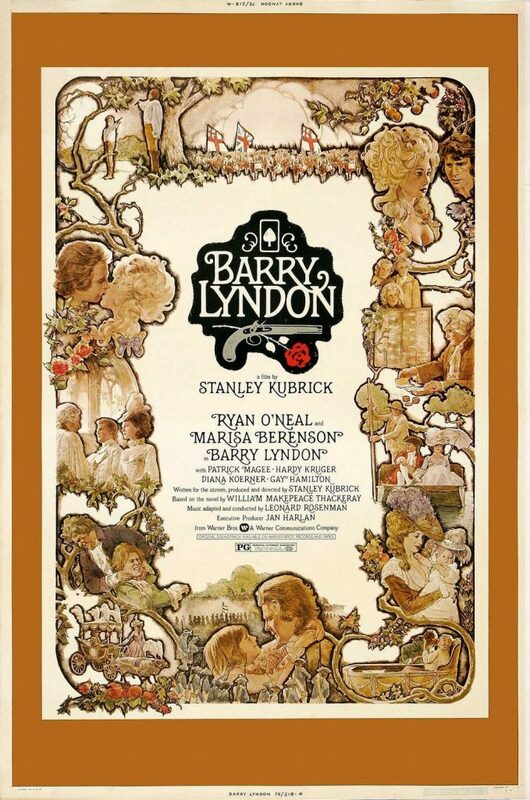 The “logo” for the movie, used throughout its marketing campaign, joins Barry’s three pursuits around his name: love is there as a rose, violence is there as a gun, and, above, a card is there as the means by which Barry achieves social mobility — by cheating. So here are Barry and Balibari playing cards with the Prince of Tubingen, a sneering fop who is begging to be taken down. Barry is Balibari’s dummy servant, and signals his master on which cards to play. Thus they cheat the Prince, who does not take his loss lightly. Violence once again asserts itself as the Prince, quite an eminence in these parts apparently, defends is place in the social order with threatening Balibari’s life. It’s noted by the narrator that card games were all the rage in European courts at this point, and it suggests the question “What does the Prince of Tubingen want?” That is, why does this member of the royalty, or any member of royalty, indulge so flagrantly in games of chance? Partly it’s is boredom, to be sure, but at another level, it seems to me, they are daring God, or the universe that deals fortune and misfortune arbitrarily, to note their special position in the cosmos. When someone like Balibari comes along and challenges what they feel is theirs by divine right — that is, luck — they are threatened and outraged. SCENE 50. There is now a second debriefing scene, as Barry relates the Prince of Tubingen story to Potzdorf and Potzdorf escalates the situation by mentioning that the Prince, whether he was or was not cheated, draws a lot of water in the local economy, and his social standing outweighs his being a poor sport. That is, Barry and Balibari risk their position as con men if they press the point with Tubingen and turn the con into a political crisis. SCENE 51. So Barry and Balibari plot to get the hell out of Dodge, in an inverse of the earlier scenes with Potzdorf. The transfer from one father figure to another is almost complete. SCENE 52. There is now a third and final de-briefing scene as Potzdorf explains to Barry how he plans to arrest Balibari. Again, this act is almost a cousin to 1973’s The Sting, if The Sting were completely absent of joy. SCENE 53. As the “caper” act comes to a close, the transfer of Barry’s affections from Potzdorf to Balibari is made literal, as Barry himself is escorted out of the kingdom in disguise as Balibari himself. That is, Barry now puts on a disguise within a disguise, signaling his transition from hapless victim to master of his destiny.